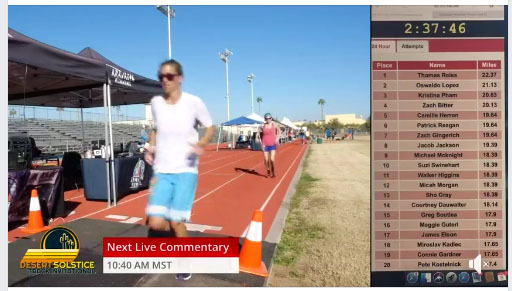 Desert Solstice Invitational 24 Hour Race 2018 is a track race taking place at Central High School Track in Phoenix, AZ. The event got underway 8:00 am local time this morning. The invitational event has amassed 60 National and 11 World records since its inception in 2010 and the event features a 100 mile race as well as the 24 hour and is billed as an opportunity to qualify for the US National 24 hour squad. There are 33 runners in the field with some of Americas top ultrarunners aiming to set new records. Currently leading the men is Thomas Reiss with Oswaldo Lopez and Zach Bitter close behind at the 3 hour point. In the women’s race Kristina Pham, Camille Herron and Courtney Dauwalter lead.